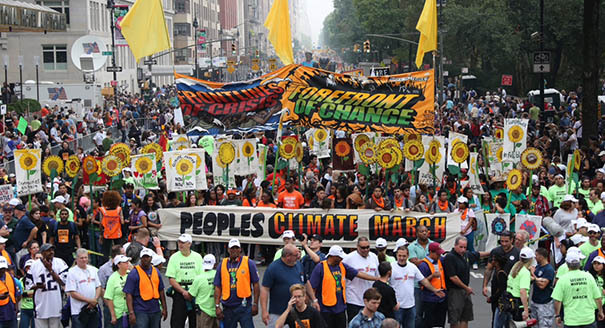 While hundreds of thousands marched in Manhattan, thousands took to the streets in cities across Canada to warn that climate change threatens civilization and life on Earth. Demonstrations took place in Vancouver, Winnipeg, Montreal and Calgary. In Toronto over 3,000 walked from City Hall through the downtown core. Hundreds travelled from Toronto by bus, train and car to participate in the huge New York march. Around the world, from London, England to Melbourne, Australia to Mexico City, to Bogota, Colombia, to Berlin, Germany, people paraded and rallied. The protests were spurred by reports that the world pumped an estimated 36.1 billion metric tons of carbon dioxide into the air last year by burning coal, oil and gas. That is 706 metric tons or 2.3 per cent more than in the previous year, according to the Global Carbon Project international team that tracks and calculates global emissions annually. The results were published in peer-reviewed journals Nature Geoscience and Nature Climate Change, in September. The leading carbon polluters are China, the United States and India. But Canada’s tar sands industry in northern Alberta is one of the biggest single contributors to the climate change malaise. The three largest parties in Parliament, the governing Conservatives, the Official Opposition labour-based New Democratic Party, and the Liberal Party all favour the construction of new pipelines to pump more bitumen-laced oil to thirsty markets – at the expense of nature, and to fuel private profit.